Restaurant and Bar Workers Unite for Decent Work for All! Restaurant and Bar Workers Rising - October 4th! It’s been a long hot summer for empoyers in the Restaurant and Bar Sector. 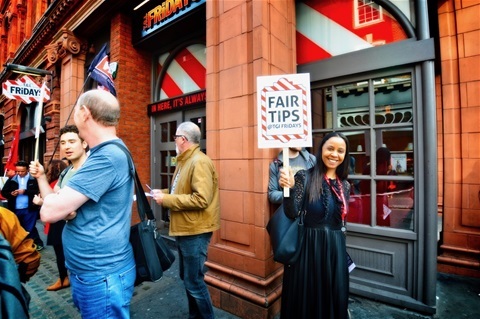 On 1st May workers at several branches of McDonalds went on strike and throughout the summer workers at TGI Fridays in London, Manchester and Milton Keynes also took strike action. The issues are the same – front of house staff and back of house staff are fed up of being pushed around, getting peanuts for pay, seeing their hours and shifts cut, having their hard earned tips dipped into to cover low pay, breakages and walkout. Now on the 4th October McDonalds and TGI Fridays plan to take further strike action, with staff from at kleast one major pub chain following. People are saying enough is enough. Lets stand up and be counted. We make the profits for these big chains. We deserve a better deal. We are calling the 4th of October Restaurant and Bar Workers Rising. It is going to be a historic day! There will be a rally in Leicester Square at 11am – followed by a meeting in Unite at Holborn at 1pm. We want to get our message across. We need stronger laws. Better pay and conditions. Minimum standard for the sector.